I thought Tom Ricketts now owned the Cubs, but it appears I've been mistaken - they're obviously owned by the Pittsburgh Pirates, strange as that sounds. After a 10-6 win over the Cubs on Friday, paced by five hits each from Garrett Jones and Andrew McCutchen, the Pirates jumped on Ryan Dempster for three runs in the top of the first on Saturday, and light-hitting Jeff Clement added a much-needed insurance home run in the 9th to upend Lou Piniella's team, 4-3, on Saturday. 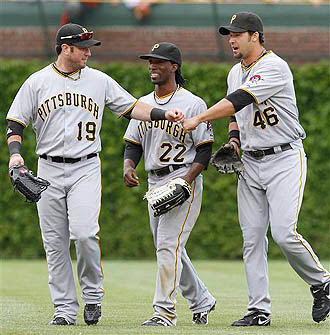 The win was the Bucs' seventh in a row against the Cubs, and their ninth win over Chicago in their last 11 meetings. I'd try to explain it, but frankly, I'm at a loss. In this one, Octavio Dotel made it very interesting late in the game, but ultimately blew away Ryan Theriot and Marlon Byrd in succession to earn his seventh save. Paul Maholm gave up eight hits and two earned runs over six innings to raise his record to 3-3 on the year for Pittsburgh. The Pirate offense was far less potent than it was on Friday, yet was still efficient enough to pull this one out. Andrew McCutchen and Clement each had two hits for the Bucs, and Ryan Church drove in two on the afternoon. The Pirates now sport a 16-20 record heading into Sunday's series finale, when Ross "Mr. Wonderful" Ohlendorf (3.00, 0-1) battles Ted Lilly (4.88, 1-3). The Buccos then travel to Philly for games on Monday and Tuesday, when the highly-anticipated faceoff of Roy Halladay and Charlie Morton goes down. It looks like that Halladay/Morton matchup will have to wait. Kyle Kendrick starts tommorrow.